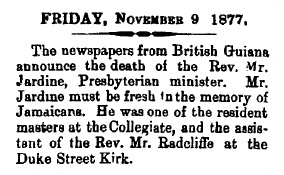 though there was apparently little written in the Gleaner in 1870.
fellow Scots of the Caledonian Society, of which he was virtually founder, and of which he was the President. 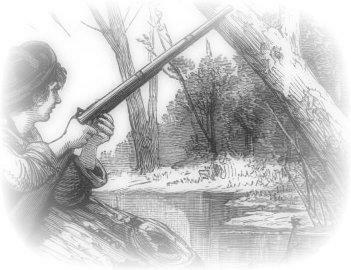 Mr Morrison's 'fowling piece' would have looked like the one in the picture below. In the early '70s it was still possible to shoot ducks at Prater's Pond, then still in existence at the bottom of the Allman Town area, where Kingston Gardens was later built. 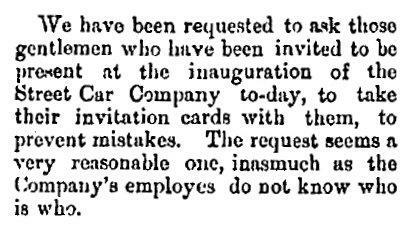 Joseph Brennan, a Collegiate 'Old Boy', still remembered the duck-shooting at Prater's Pond when he was in his 90s, in the early 1950s. a supply of food for the neighbourhood and targets for the guns of sportsmen, for whom the place was a favourite resort until about 80 years ago [i.e. 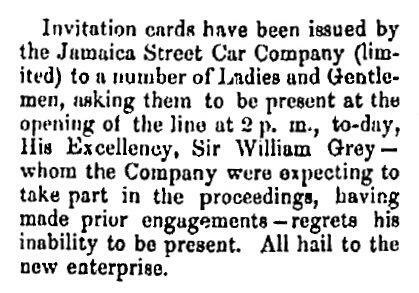 mid 1870s], when the picturesque but most insanitary pond - a huge breeding place for mosquitoes - was drained and the select residential district of Kingston Gardens began to be built upon the reclaimed land. [predict ] a bright future for her sons. 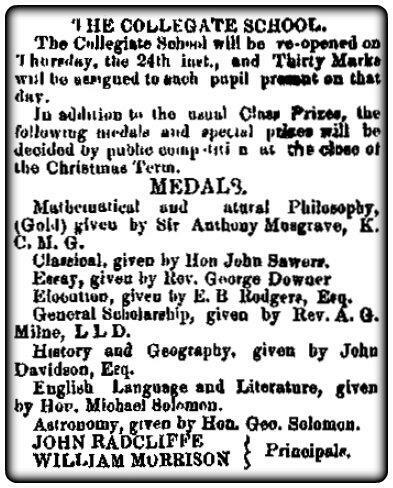 please click on the images below; these prize lists are all I have found so far about the Collegiate in 1872. 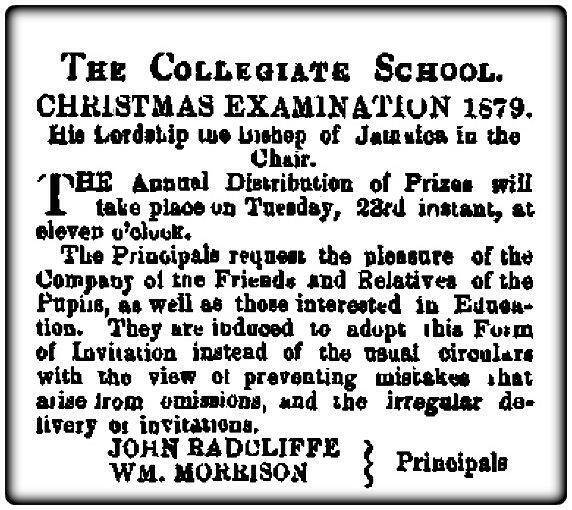 Collegiate Boys are at the present time completing their studies at these great seats of learning. 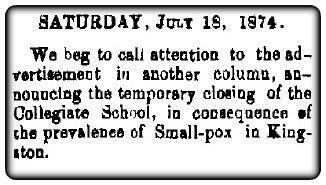 leading to a brief postponement of the start of the new term at the Collegiate School. 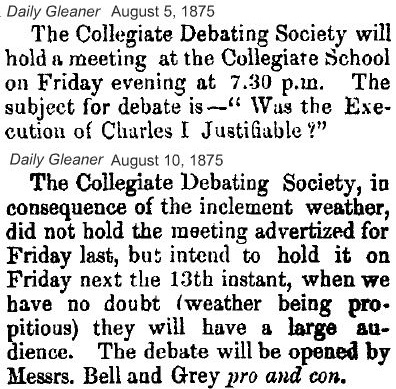 I have found no account of the postponed debate. 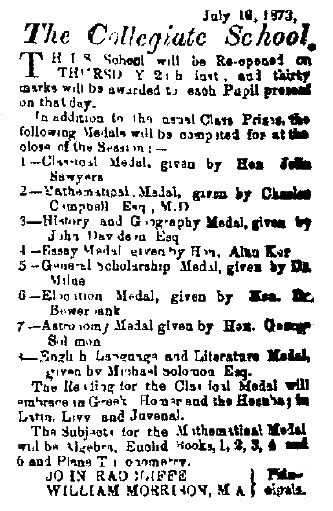 Click on the image below for the Prize Giving and Prize List for Christmas 1875.
to as the Collegiate Hall, hosted a wide variety of functions. 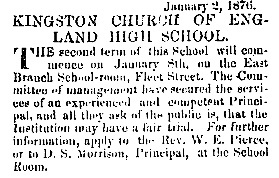 It was rebuilt after the 1907 earthquake and demolished in 1949. 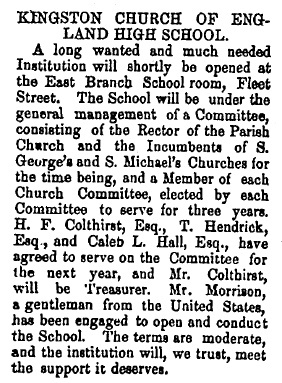 In the latter part of 1876 another attempt was made to establish a boys' secondary school under the auspices of the Church of England. 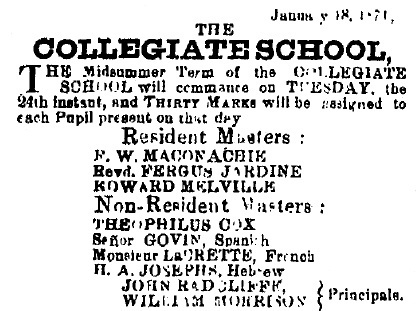 In the 1880s this school was amalgamated with the Collegiate School for several years. 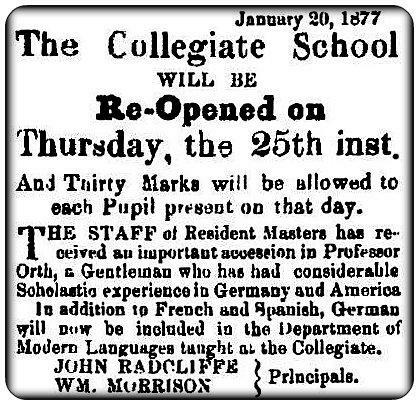 Somewhat confusingly the principal of the new school was also called Morrison, D S Morrison, an American with long experience in teaching. 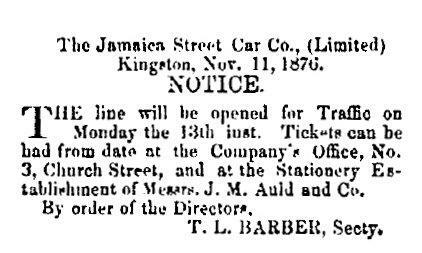 It is of some interest that in November 1876 the first, mule-drawn, streetcars began to operate in Kingston, and so, presumably, the 130 year story of Kingston school children and public transport commenced. 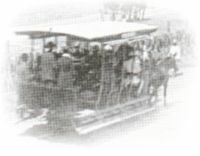 The picture of this mule-drawn streetcar on its way to the Exhibition in 1891 is the only one I have seen of a mule-drawn streetcar in Kingston; there are many pictures of the later electric cars introduced in the late 1890s. 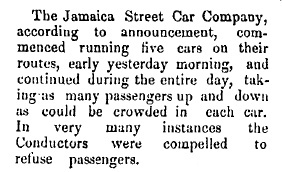 Montgomery's Corner was the old name for Cross Roads. 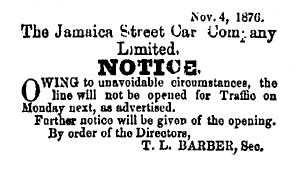 The line from Cross Roads to Half-Way-Tree was opened in November 1877. 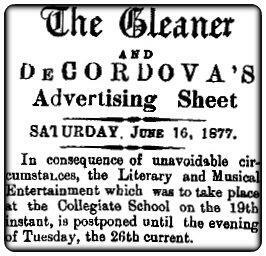 In June 1877 an interesting concert featuring a local Black poet, Matthew Josephs, was held at the Collegiate School. 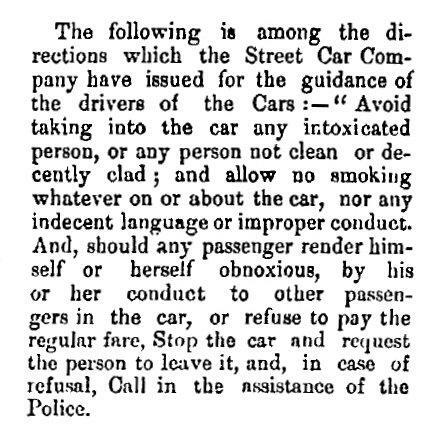 For more, click below. 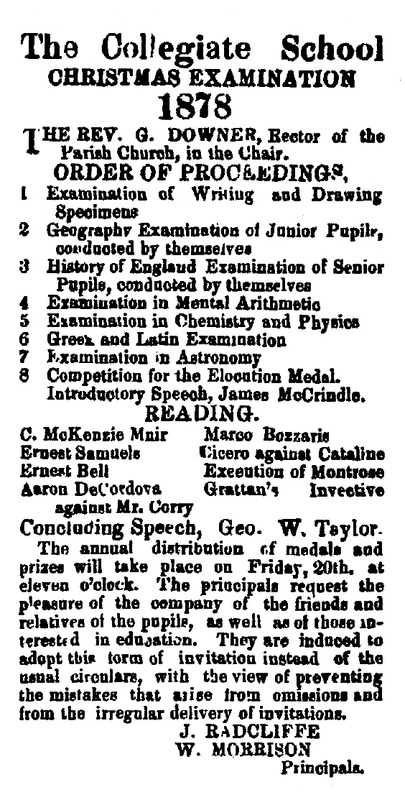 The school, of course, continued its work, but I have not found any account of a prize-giving in the summer of 1877. 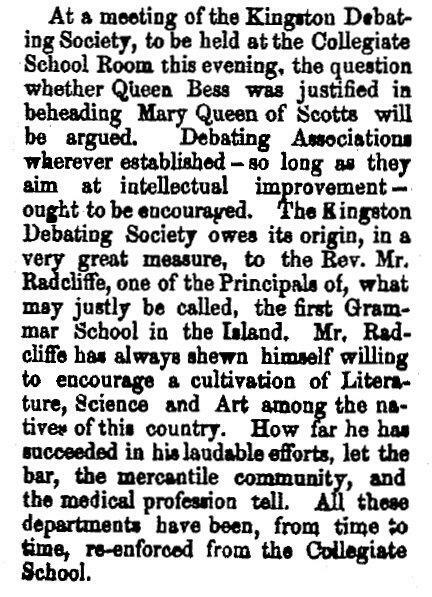 Nor have I found much further information for 1877; one item refers back to the earlier years of the school, with a note of the death of the Rev Mr Jardine in british Guiana. 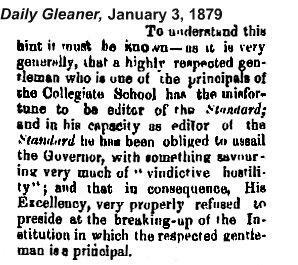 In January 1877 William Morrison had become editor of the Colonial Standard for which he had frequently written articles in the past. 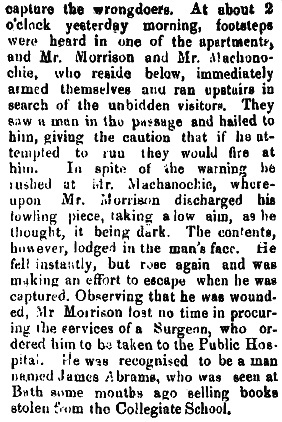 The newspaper work certainly took up time, and also increasingly involved Morrison in political issues which at the time were increasingly involved with the demand for restoration of representative institutions in the island. 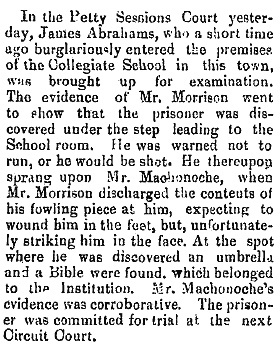 This journalistic activity may, or may not, explain the few references to the school in 1878: it certainly brought him into confrontation with Sir Anthony Musgrave who had become Governor in the fall of 1877. 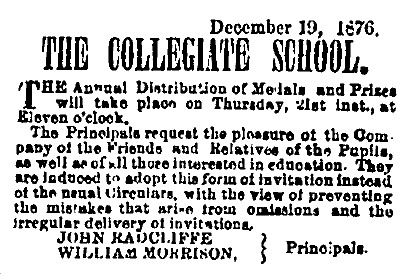 I have found nothing relating to the Collegiate School in the first half of 1879. 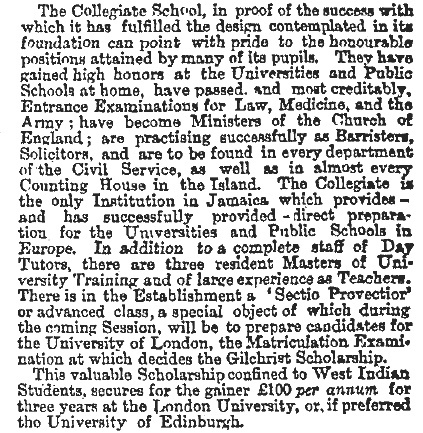 In September an item in the Gleaner was a reminder of the successes being achieved by old boys of the Collegiate School. 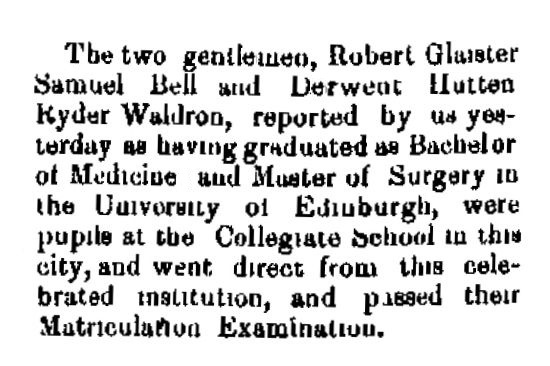 Derwent Waldron had been there in the later 1860s, but although there were pupils named Bell at the School at that time, I have not identified Robert G S Bell. 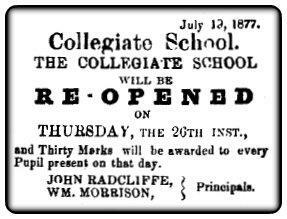 By the end of the 1870s the Collegiate School had established itself, over more than 25 years, as the leading secondary school in the island - writing of the need for more institutions of secondary and tertiary education in Jamaica, a writer to the Gleaner in 1878 referred to them as 'higher schools, of which the far-famed Collegiate is a prominent pattern'. 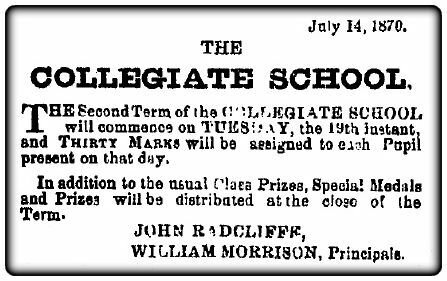 The 1880s were to be far more troubled years, which the Collegiate School only survived in a re-incarnated version, entirely shaped by William Morrison, and sustained by him for another decade and a half.